TV stars and former footballers have taken part in a celebrity charity match in memory of Bradley Lowery. 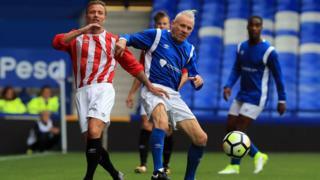 Two teams, led by Everton legend Peter Reid and model Katie Price, went head-to-head at Goodison Park. Sunderland fan Bradley, who died from a rare type of cancer aged six, "would've absolutely loved it" and will "be there in spirit", his mum Gemma Lowery said. Players included ex-Everton stars Peter Beardsley and Alan Stubbs and singer-songwriter Olly Murs. The Lowery Legends beat Bradley's Blues 7-3 with Bradley's uncle scoring for the winning team and X-Factor winner turned Coronation Street actor Shayne Ward scoring from the penalty spot for the losing side. Peter Reid came on for Steps star Lee Latchford-Evans while former Sunderland left-back Micky Gray and Calum Best also made an appearance. The Bradley Lowery Foundation, which was set up after the youngster's death to help other children suffering illness, and Everton in the Community will benefit from the funds raised. Bradley died on 7 July having been diagnosed with neuroblastoma when he was 18 months old. Evertonians formed a special bond with the youngster, initially during Everton's match at Sunderland in September 2016 and then when he was a guest at Goodison Park for two matches in January and February this year. Bradley's mum said football "was his passion" and he even made them take him to watch "when he was really poorly... because he loved it that much". "He loved meeting people, he was very sociable. He was a very happy little boy", she said. "He'll be there in spirit. He won't miss that." Image caption Bradley's mum Gemma Lowery described him as "a very happy little boy"
Ex-Everton player and club ambassador Graham Stuart said it was "an honour" to take part. "Bradley was a terrific young man who showed so much heart to fight off his problems but unfortunately they overcame him in the end. "There are loads of kids out there with similar situations and the foundation is there for them as well."